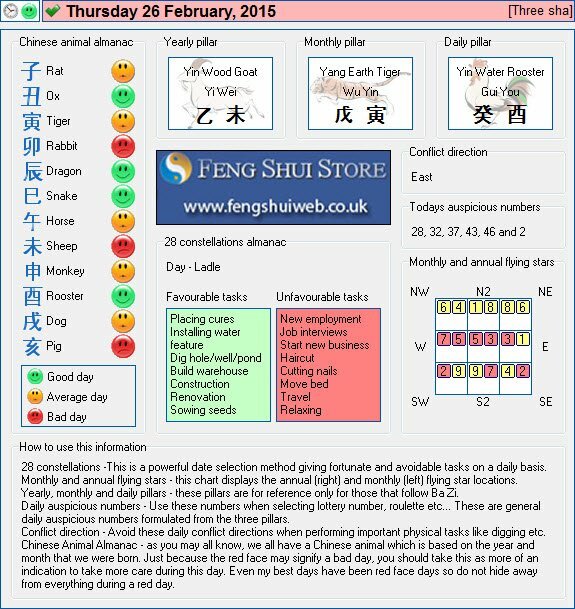 Here is the Free Feng Shui Tong Shu Almanac for Thursday 26th February 2015.
i am planning to buy 2015 cures. when will be the best time to place them. our main door is facing south (if you go out of the house, you are facing south). also, i am about to take the Philippine Bar Exam to be a lawyer on November 2015, results will be released on March 2016. what qill be the most favorable date and time for me to Petition to take the exams? The best time to place the Cures is either 03:00 – 04:59, 11:00 – 12:59, 13:00 – 14:59 or 19:00 – 20:59. Hope this helps Che and good luck on your exam. also, i am about to take the Philippine Bar Exam to be a lawyer on November 2015, results will be released on March 2016. These numbers are the Flying stars for the month and year in a home or office. You can find out more about them on the links below.